The gradual normalization of relations between Kazakhstan, the Kyrgyz Republic, Tajikistan and Uzbekistan has revived the idea of creating an analogue of the Schengen zone. 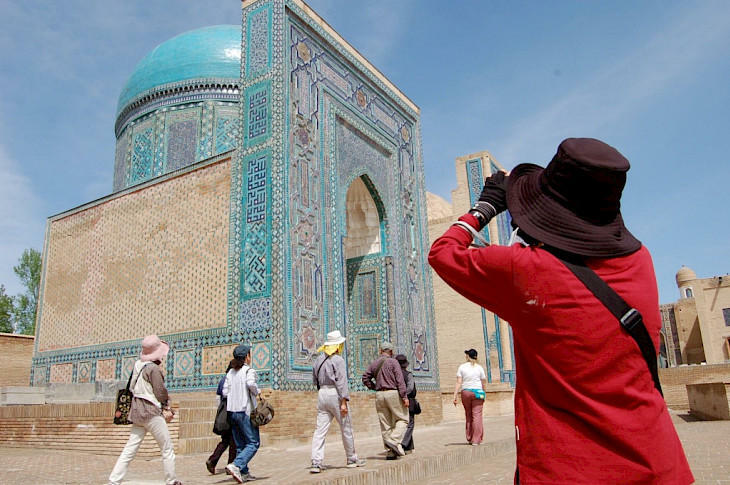 Uzbekistan and Kazakhstan in February 2019 can launch the Silk Visa general program, stated Acting First Deputy Chairman of the State Committee for Tourism Ulugbek Kasimkhodzhaev. As he said, the two countries agreed on the draft Silk Visa. He added that the parties should agree on technical details and equipment. Kasimkhodzhaev noted that other countries in the region are also showing interest in this project. Among them - Kyrgyzstan and Tajikistan. At the same time, Kazakhstan also proposes to connect Azerbaijan and Turkey to this project. Uzbekistan and Kazakhstan signed in mid-November agreements on the mutual recognition of visa regimes by the countries of the Silk Road. For the first time, the creation of a “silk visa”, uniform for the whole of Central Asia, was launched in June of this year, the idea is supported by Kazakhstan, Uzbekistan, Kyrgyzstan and Tajikistan. It belonged to the chairman of the committee on international relations, defense and security of Kazakhstan, Dariga Nazarbayeva. She also advocates the option of removing visa barriers in Central Asia. At the core of the Asian continent lies Central Asia, a region rich in history and steeped in culture. This region benefits from a blend of national identities that have been carefully cultivated over many centuries. Central Asia, as it is defined today, is comprised of five former Soviet republics: Kazakhstan, Kyrgyzstan, Tajikistan, Turkmenistan, and Uzbekistan. Central Asian countries constitute a large region with a population of about 70 million people. According to the UN, over the past 10 years, the average GDP growth in Central Asian countries as a whole was 6.2 percent, when the whole world developed at a rate of 2.6 percent. There has also been a sharp increase in trade, which has doubled in 10 years, from $ 1.6 billion to $ 3.1 billion. Uzbekistan and Kazakhstan currently experience a rise in mutual economic ties. In 2017, the trade turnover between the two Central Asian nations increased by 8.6 percent and exceeded $ 2 billion. In January-June 2018, the trade turnover between the two countries increased by 52 percent, with Uzbek exports growth of 48 percent. Over 200 companies with Kazakh capital currently operate in Uzbekistan. Earlier this year, Uzbekistan and Kazakhstan agreed to take further measures to ensure the growth of trade turnover to $ 3 billion in 2018 and $ 5 billion by 2020. The countries also intend to increase the number of rail, bus and air communication between two states. Uzbek investments in Kazakhstan for the past 10 years amounted to $ 31.3 million, half of which falls for 2016. Kazakh investments in Uzbekistan totalled $ 114.4 million in the past decade.